Can You Help Decode The Unknown Language On This 750-Year-Old Sword? In 1825, a three-foot-long sword was uncovered from a river on the eastern cost of England. “If struck with sufficient force, it could easily have sliced a man’s head in two,” writes the British Library’s Julian Harrison. Though its potential uses might be obvious, the gold inscription on its face is not. The blade belongs to the British Museum but is currently on display at the British Library as part of an exhibit on the Magna Carta. 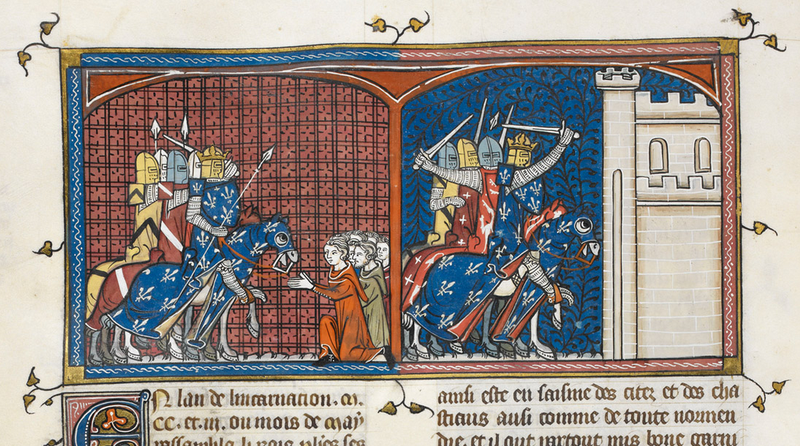 The sword dates from between 1250 and 1330, and the museum points out that isn’t too different from those being brandished in this manuscript from around the same time (above), detailing the conquest of Normandy by the French. “No covering shall be over me”? Possibly meaning the sword and it’s’ owner will always be ready for battle? Any symbology that might appear on that side is very important. From an alphabet perspective, I was immediately struck by the inclusion of the letter W as it wasn’t in general use in that form until some point during the 14th century when it began shifting from begin written as the the digraph to being written as the ligature more frequently as the 15th and 16th centuries approached. I don’t think I would have stopped if it weren’t in the form it is in. In the early versions of the W ligature it is most commonly written as two V’s whose legs cross over each other. Time and scribal laziness eventually eliminate the crossed sections for ease of writing. This particular W letter form has an apex that is half the height of the arms of the W letter suggesting that the engraving was added nearer the 15 or 16th century. It is important to note that the W letter form is used natively in: German, Dutch, English, Welsh, Polish, Walloon and Maltese. Most romance languages including the Latin of the day did not use the W.
Using the excellent research by Thomas Wagner and John Worley, an image of a hugely successful medieval workshop was created, making ‘magical’ swords for the elite. The swords themselves are of a high quality, but what most catches the eye are the inscriptions. Both their mysterious contents and the similarities in the lettering are striking. A sword from Sweden might use the same slightly curved X as the River Witham sword. A sword currently in Berlin has an I-S contraction also used on a sword found in the Netherlands. These similarities go so far as to suggest the same hand in making the inscriptions. However, their contents are still a mystery, regardless of their origins. Harrison even went on the BBC to talk about the response—but it seems that despite hundreds of comments and massive amounts of press, no one has cracked the code. While the inscription may remain a mystery for some time, and indeed may elude us forever, it’s interesting to see how quickly readers—from academics who specialize in medieval languages to total laypeople—were to respond with theories. We’ll keep an eye out for more details as they emerge.